Arthritis is the leading cause of disability in the United States [1,2] though not all racial and ethnic groups are equally affected by the disease. Nationally, non-Latino Blacks, Latinos, and multiracial persons living with arthritis were more likely to report arthritis-attributable activity limitations, work limitations, and joint pain when compared with non-Latino Whites [1, 3-5]. In North Carolina, Latinos were more likely to report poor or fair health than Blacks or Whites, while Blacks were most likely to report eight or more days of poor physical and mental health as well as eight or more days of activity limitations . In a recent report of National Health Interview Survey data, access to health care was identified as a potential cause of racial disparities in arthritis-related health outcomes . Using a sample of individuals with arthritis who have access to a primary care physician in North Carolina, our goal is to describe how Black, White, and Latino participants with arthritis differ from each other demographically and in terms of quality of life. Specifically, we will describe differences in self-reported health status, physical and mental quality of life, and activity limitations. Cross-sectional data were collected in 2005 and 2008 as part of the North Carolina Health Project, which enrolled participants from the North Carolina Family Medicine Research Network (NC-FM-RN). The NC-FM-RN is a statewide practice-based network comprising multiple family practice sites across North Carolina . For the 2005 and 2008 recruitment periods, 11 primary practice sites were purposefully selected from both urban and rural areas of North Carolina to increase enrollment of non-white participants. Five sites were for-profit private practices, four were nonprofit outpatient clinics, one was part of a hospital system, and one was a community health center. This study was approved by the Institutional Review Board at the University of North Carolina at Chapel Hill. All participants provided written consent prior to enrolling in the study. At each NC-FM-RN practice site, all consecutive patients seeking care were approached by study staff and informed of the North Carolina Health Project. To be eligible to participate, individuals had to be at least 18 years of age and agree to complete the written study questionnaire. The 10 to 15-minute questionnaire was available in English or Spanish. The English version of the survey was translated into Spanish and then reverse-translated into English by two native Spanish-speakers. Discrepancies in translation were resolved and reviewed by two other staff members who were fluent in Spanish, yielding the final version of the Spanish survey. All questionnaires were self-administered, although trained research assistants were available to assist individuals as needed. No incentive was provided to complete the survey. The response rates for the 2005 and 2008 data collection waves were 74.8% and 63.9%, respectively (Fig. 1). Individuals listed as ‘unable to communicate’ were unable to do so because of dementia or illness-related issues. A total of 3,542 eligible participants completed the survey, though we have restricted our analyses to participants with self-reported arthritis (n=749) who reported White (n = 405), Black (n = 244), or Hispanic/Latino (n = 100) race/ethnicity. Six-hundred fifty-two participants completed the survey in English and 97 (93 Latino, 4 White) participants completed the survey in Spanish. The arthritis prevalence rate was 25.1% for Whites, 24.7% for Blacks, and 15.7% for Latinos. The survey included measures for arthritis status, race/ethnicity, health-related quality of life, activity limitations, health status, and demographic variables. Variations in measurement between the 2005 and 2008 surveys are described below. Arthritis Status. Participants self-reported their arthritis status. The definition of self-reported arthritis is based upon the Centers for Disease Control and Prevention’s definition, which groups various rheumatic conditions (e.g. lupus, fibromyalgia) together with arthritic conditions (e.g. osteoarthritis, rheumatoid arthritis). The arthritis definition varied somewhat depending on the year of participant recruitment. In 2005, participants self-reported whether they had osteoarthritis (OA), rheumatoid arthritis (RA), or fibromyalgia (FM) during the last 10 years; whereas, in 2008, participants were asked whether a doctor or other health professional had told them that they had problems with OA, RA, or FM during the last ten years. If participants indicated that they had OA, RA, or FM, then they were categorized as self-reported arthritis and included in the analysis. Race/ethnicity. Self-reported race/ethnicity varied based on the year of participant recruitment to mirror the U.S. Census race and ethnicity questions. In 2005, participants were asked whether their race/ethnicity was: Black; White; Mexican, Mexican American, or Chicano; and/or Other Spanish, Hispanic, Latino. In 2008, participants were asked separate questions about race and ethnicity (“are you Hispanic or Latino/Latina?”). Individuals who reported Mexican, Mexican American, Chicano, Other Spanish, Hispanic or Latino (2005 survey) or Hispanic/Latino ethnicity (2008 survey) were included in the Latino category. Individuals were included in the White category if they exclusively selected “White” as their race and were included in the Black category if they exclusively selected “Black” as their race. Two individuals selected Black race and Latino ethnicity and were included in the Latino category. Health-related quality of life. The Centers for Disease Control and Prevention Health-Related Quality of Life (CDC HRQOL) Healthy Days measure, which has demonstrated acceptable validity and reliability in previous studies [8,9], assessed physical and mental health-related quality of life. The CDC HRQOL measure includes two single-item indicators of physical and mental HRQOL: 1) “Now thinking about your physical health, which includes physical illness and injury, for how many days during the past 30 days was your physical health not good?” 2) “Now thinking about your mental health, which includes stress, depression, and problems with emotions, for how many days during the past 30 days was your mental health not good?” Responses to each item are treated as continuous variables with higher scores indicating worse HRQOL. Activity Limitations. The CDC HRQOL measure also assesses activity limitations with the following item: “During the past 30 days, for about how many days did poor physical or mental health keep you from doing your usual activities, such as self-care, work, or recreation?” Higher scores indicate a greater number of days that activity limitations were experienced. General health status. One item from the SF-12  assessed general health status: “Overall, how would you rate your health in the past four weeks?” Responses ranged from 1= ‘excellent’ to 5= ‘poor’. For our analyses, we dichotomized responses into ‘fair or poor health’ and ‘good health’ (excellent, very good, good) categories. Demographic variables. Age and gender (male=referent) were assessed with single-item questions. Body Mass Index was calculated using participant self-reported height and weight (kg/m2) and was dichotomized into two groups: BMI >30 and BMI ≤30 (referent). Education was assessed by asking individuals about their highest degree or level of school completed; we dichotomized education into ‘less than high school education’ and ‘high school education or more’ (referent) categories. For relationship status, we combined ‘married’ and ‘living with a partner’ responses to create a ‘non-single’ group and combined the ‘widowed’, ‘separated/divorced’, and ‘never married’ groups to create a ‘single’ (referent) group. Participants also were asked whether they had any of the following comorbid conditions: heart disease, high blood pressure, lung disease, stroke or min-stroke, depression, chronic back pain, cancer, or diabetes. We created a count variable for comorbid conditions which ranged from 0 (no comorbid conditions) to 8 (all comorbid conditions). Using Stata 9.0 (StataCorp LP, College Station, Texas), descriptive statistics were computed to describe the sample and one-way analysis of variance (ANOVA) identified racial differences in demographic and clinical variables among White, Black, and Hispanic/Latino participants. If an ANOVA was significant, we followed up with multiple comparison tests, with Bonferonni-adjusted significance, to determine which groups were significantly different from each other. To analyze whether there were racial differences in quality of life and activity limitations, we regressed each CDC HRQOL item on race/ethnicity, controlling for age, gender, education, BMI, relationship status, and number of comorbid conditions. A logistic regression explored racial/ethnic differences in self-reported health status, controlling for age, gender, education, BMI, relationship status and number of comorbid conditions. In all regression analyses, White was the referent racial group. Overall, the sample was predominantly female, middle-aged, and had some college education (Table 1). Latinos were significantly more likely to be male, younger, and have a high school education or less when compared with Whites or Blacks. Blacks were also more likely to report a high school education or less when compared with Whites. The average BMI for all groups was over 30, but Blacks were more likely to have a BMI greater than 30 when compared with Whites and Latinos. Also, Blacks were more likely to be single than Whites or Latinos. OA (n= 305) and RA (n= 183) were the most commonly reported conditions across racial/ethnic groups. Overall, participants had approximately two comorbid health conditions, and almost half reported getting little or no daily exercise. Latinos reported fewer comorbid conditions than either Whites or Blacks. *** p < .001 (1-way ANOVA comparing racial/ethnic groups). Note: Race (White = referent group). a Excellent/Very Good/Good health = 0, Fair/Poor health =1. Regarding quality of life during the past 30 days, on average, participants reported more than 12 days of poor physical health and almost 10 days of poor mental health. There were no significant differences between racial groups in the number of days of poor physical or mental health. Latinos reported significantly fewer days of activity limitations but were more likely to report a poor or fair health status than Blacks or Whites. Blacks were also more likely to report a poor or fair health status when compared with Whites. Table 2 presents the linear regression results for the three CDC HRQOL measures adjusting for age, gender, education, BMI, relationship status, and number of comorbid conditions. Using White as the referent racial group, neither Black nor Latino race/ethnicity were significantly associated with days of poor physical health; however, Black race was significantly associated with fewer days of poor mental health. Latino ethnicity was associated with significantly fewer days of activity limitations due to poor health. Older age and non-single relationship status were associated with fewer days of poor physical and mental health as well as fewer days of activity limitations. In contrast, having more comorbid conditions was associated with more days of poor physical and mental health and more days of activity limitations. The logistic regression results for health status are presented in Table 3. Latinos had 3.67 times higher odds than Whites of reporting a fair or poor health status when adjusting for other covariates. Younger age, less education, not having a spouse/partner, and having more comorbid conditions were also associated with greater odds of reporting fair or poor health status. In our sample of people seeking care at family practice clinics, Whites, Blacks, and Latinos with arthritis all reported compromised quality of life, as evidenced by reporting nine or more days of poor physical and mental health as well as six or more days of activity limitations during the past month. Moreover, over 50% of the sample reported poor or fair health status. Even though all groups reported compromised health, there were two racial/ethnic differences: 1) Latinos were more likely than Whites and Blacks to report a poor or fair health status but less likely to report activity limitations, and 2) Blacks reported fewer days of poor mental health. Our finding that Latinos were more likely to report fair/poor health and fewer days of activity limitations than Blacks and Whites is consistent with other studies  and the 2005 North Carolina BRFSS data . The disparity between general health and activity limitations could be due to cultural differences in the understanding of health. As noted by Wagner and colleagues , the “fair” response carries a less negative connotation in Spanish than in English. Alternatively, Latinos may be more likely to associate their health status with other factors, such as socioeconomic status (SES). As demonstrated by Kandula and associates , Latinos’ probability of selecting fair/poor health was reduced by almost half when adjusting for SES. 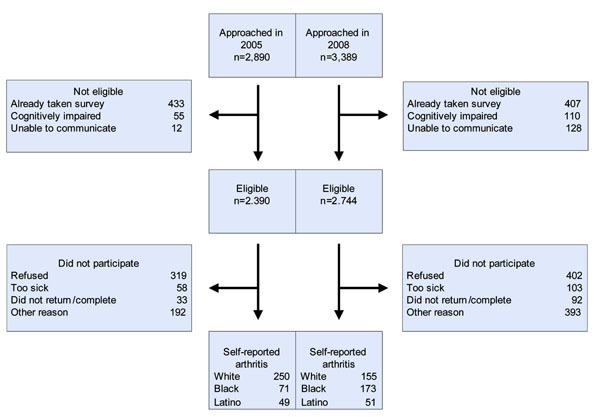 However, in our regression model which controlled for education level, Latinos still reported fewer days of activity limitations than Blacks or Whites. Future research should explore the reasons behind this somewhat paradoxical finding. Specifically, qualitative investigations could describe the impact different factors, such as language, culture, and employment situations, make on individuals’ reports of self-rated health and activity limitations. We also found that, when controlling for various sociodemographic factors, Blacks reported significantly fewer days of poor mental health than Whites. Similarly, our unadjusted analyses revealed that Blacks reported the fewest number of poor mental health days, although the unadjusted difference between racial/ethnic groups was not statistically significant. This finding is not consistent with the 2005 North Carolina BRFSS data, which found that Latinos reported the fewest days of poor mental health. We are unsure of why our results differ with previous research. Blacks in our sample had a relatively high level of education when compared with other samples . Consequently, they may have had more economic resources, which could contribute to positive perceptions of mental health. Almost half of the sample reported engaging in little or no exercise during a usual day. Although our measure of physical activity was limited and does not explicitly include exercise at work, given that physical activity can reduce arthritis symptoms and increase patient quality of life [14,15], it is important to accurately assess individuals’ exercise behaviors and explore what barriers exist for patients engaging in physical activity. Family practice settings may provide a suitable venue through which to reach these participants and promote physical activity interventions. Because the arthritis prevalence rate for Latinos (15.7%) in our sample was higher than that of non-clinic based samples [3,6], clinics may provide an ideal venue to reach Latinos with arthritis. Our regression models revealed that younger age, single marital status, and a greater number of comorbid conditions were robust predictors of worse health and more activity limitations. These factors should be taken into account when targeting arthritis interventions to different racial/ethnic groups. Given these preliminary results, providers may want to consider discussing quality of life issues with patients, with a specific focus on whether their arthritis is interfering with their ability to conduct activities of daily living. Our study results should be interpreted with caution for several reasons. First, our measure of self-reported arthritis status may not be accurate, although it has been shown to be valid and reliable in previous studies [16,17]. Second, even though participants had access to a primary care physician at the time our interview, this does not mean that they had consistent access to quality health care. Also, the generalizability of our results is limited by our sample, which was predominantly female and well-educated. Although our response rates were over 60%, we cannot be sure if people who refused were statistically different from those who responded or whether our results from a clinic-based sample in North Carolina would generalize to other states. Because our data are cross-sectional, we do not know what caused participants to report lower quality of life and greater activity limitations. It is possible other non-rheumatic health conditions may have been responsible for patients’ compromised quality of life and increased activity limitations. Additionally, we did not compare specific types of arthritis because subdividing the sample by arthritic condition would lead to small cell sizes and decrease power to test for differences across our three racial/ethnic groups. Future studies may want to examine whether quality of life and activity limitations vary across race/ethnicity as well as arthritis type. Last, our grouping of racial categories did not allow us to explore how people who reported multiple races/ethnicities, such as Black race and Latino ethnicity, differed. Despite access to a primary care physician, racial/ethnic differences in quality of life, health status, and activity limitations exist. Latinos and Blacks reported significantly worse health status than Whites and this difference remained significant for Latinos after adjusting for various demographic and clinical factors. There was not a significant difference in activity limitations or physical health between Whites and Blacks. Access to a primary care physician alone may not benefit Latinos because language and cultural issues may impact providers’ ability to deliver the same quality of care to Latinos as Blacks and Whites. Thus, we agree with Abraido-Lanza and colleagues’  assessment that quality of care may be more important for health-related outcomes than access to care. This research was supported by the Thurston Arthritis Research Center Postdoctoral Traineeship (5T32-AR007416). We thank Jennifer Milan Polinski and Shannon Currey for assistance in the establishment of the cohort, and Rebecca Cleveland for her statistical help with the manuscript. We also thank C. Madeline Mitchell for managing the cohort, overseeing the data entry and organization, and commenting on the manuscript. We thank the following family practices in the NC-FM-RN for their participation: Orange Family Medical, Hillsborough; Crissman Family Practice, Graham; Siler City Community Health Center, Siler City; HealthServe Community Clinic, Greensboro; Durham Family Practice, Durham; Karen L. Smith, MD, PA, Raeford; Centro Medico Latino, Charlotte; Bethel Family Medicine, Bethel; Cashie Medical Center, Windsor; Moncure Community Health Center, Moncure; Lumber River Family Practice, Lumberton. Centers for Disease Control and Prevention (CDC). Prevalence of Doctor-Diagnosed Arthritis and Arthritis-Attributable Activity Limitation United States, 2007–2009 MMWR 2010; 59: 1261-5. Hootman J, Helmick C. Projections of US prevalence of arthritis and associated activity limitations Arthritis Rheum 2006; 54: 226-9. Bolen J, Schieb L, Hootman J, et al. Differences in the prevalence and impact of arthritis among racial/ethnic groups in the United States, National Health Interview Survey, 2002, 2003, 2006 Prev Chronic Dis 2010; 7: 1-5. Jordan J, Lawrence R, Kington R. Ethnic health disparities in arthritis and musculoskeletal diseases: report of a scientific conference Arthritis Rheum 2002; 46: 2280-6. Shih V, Song J, Chang R. Racial differences in activities of daily living limitation onset in older adults with arthritis: a national cohort study Arch Phys Med Rehabil 2005; 86: 1521-6. Sloane P, Callahan L, Kahwati L, Mitchell C. Development of a practice-based patient cohort for primary care research Fam Med 2006; 38: 50-7. Centers for Disease Control and Prevention (CDC). Measuring Healthy Days: Population assessment of health-related quality of life Atlanta, GA, CDC 2000. Mielenz T, Jackson E, Currey S, DeVellis R, Callahan L. Psychometric properties of the Centers for Disease Control and Prevention Health-Related Quality of Life (CDC HRQOL) items in adults with arthritis Health Qual Life Outcomes 2006; 4: 66. Ware J, Kosinski M, Keller S. A 12-item short-form health survey: construction of scales and preliminary tests of reliability and validity Med Care 1996; 34: 220-33. Chowdhury P, Balluz L, Strine T. Health-related quality of life among minority populations in the United States, BRFSS 2001-2002 Ethn Dis 2008; 18: 483-7. Wagner A, Gandek B, Aaronson N, et al. Cross-cultural comparisons of the content of SF-36 translations across 10 countries: results from the IQOLA project J Clin Epidemiol 1998; 51: 925-32. Kandula N, Lauderdale D, Baker DW. Differences in self-reported health among Asians, Latinos, and Non-Hispanic Whites: the role of language and nativity Ann Epidemiol 2007; 17: 191-8. Callahan L. Physical activity programs for chronic arthritis. Arthritis in the family practice setting: associations with education and community poverty Curr Opin Rheumatol 2009; 21: 177-82. Musa A. Exercise and arthritis special-themed issue Arthritis Care Res 2003; 49: 428-77. Sacks J, Harrold L, Helmick C, Gurwitz J, Emani S, Yood R. Validation of a surveillance case definition for arthritis J Rheumatol 2005; 32: 340-47. Bombard J, Powell K, Martin L, Helmick C, Wilson W. Validity and reliability of self-reported arthritis: Georgia senior centers, 2000-2001 Am J Prev Med 2005; 28: 251-8. Abraido-Lanza A, White K, Armbrister A, Link B. Health status, activity limitations, and disability in work and housework among Latinos and non-Latinos with arthritis: an analysis of national data Arthritis Care Res 2006; 55: 442-50.